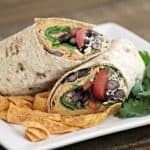 These Taco Hummus Wraps are a tasty way to change things up for Taco Tuesday and the homemade hummus is a great base for your favorite fixin’s. 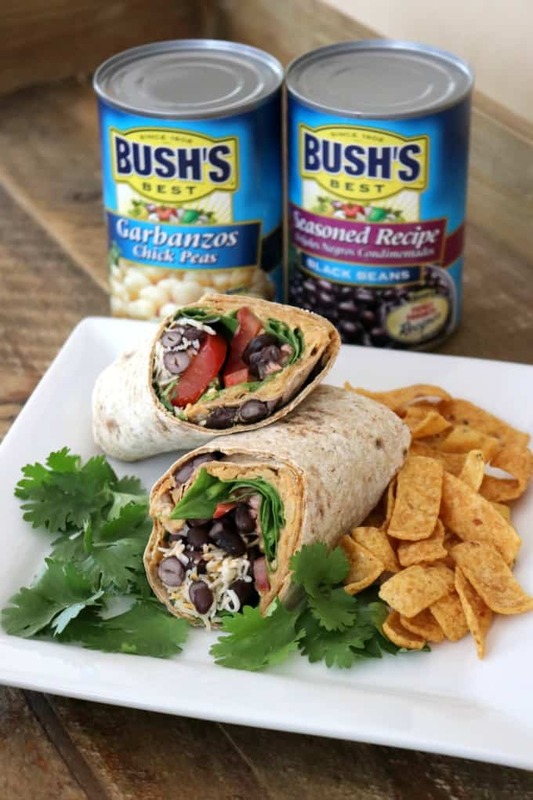 Bush’s Beans gives you healthy and easy ways to make mealtime more fun and flavorful! It’s monsoon and haboob season here in Arizona. And it usually means the slightest cloud formation sends us all into a tizzy. Seriously. We can go three months or more without seeing rain, so when this time of year rolls around we’re ready! I found myself doing a lot of errands earlier in the week. They included one of my thrice-weekly jaunts to Walmart to pick up a multitude of groceries. It was sunny when I went in and just as I put my pantry supply of Bush’s Beans into the cart, I heard what sounded like a freight train. There are no freight trains where we live. There aren’t even any train tracks. I’ve heard it quite a few times in Walmart actually and knew immediately that it was pouring outside. I hoped that it would cease before I returned to my car. Fortunately, I walked through the parking lot in a light rain and didn’t get too wet. To make the taco hummus, I used my homemade taco seasoning. I love having this stuff on hand because it’s less expensive than the packages I buy from the store. I also love that I can pronounce every single thing I put into it meaning that there’s nothing artificial. SCORE! Hummus is great to eat as a snack or spread on a sandwich as I did for these Taco Hummus Wraps. This Roasted Garlic Hummus doesn’t last long when I make it. I often eat it with cut up cucumber and red pepper slices. My Dill Pickle Hummus is SO addicting. It really does taste like dill pickles and I absolutely love it! If there’s a pickle lover in your life, treat them to this! I love having an assortment of cans (and I do mean cans!) of Bush’s Beans in my cupboard. Since our daughter’s become a vegetarian, she’s been eating a lot of them because they’re such a great source of protein. You can use them in a variety of recipes, too! I love this Mexican Bean Salad. It’s so colorful and is full of flavor! This Easy One Skillet Cornbread Casserole will make a great meal for a busy weeknight. I also love that there will be very little clean up! I’m excited to make these Hawaiian BBQ Roasted Chickpeas. We’ve been roasting chickpeas and eating them as a snack. I have to warn you, they’re addicting! 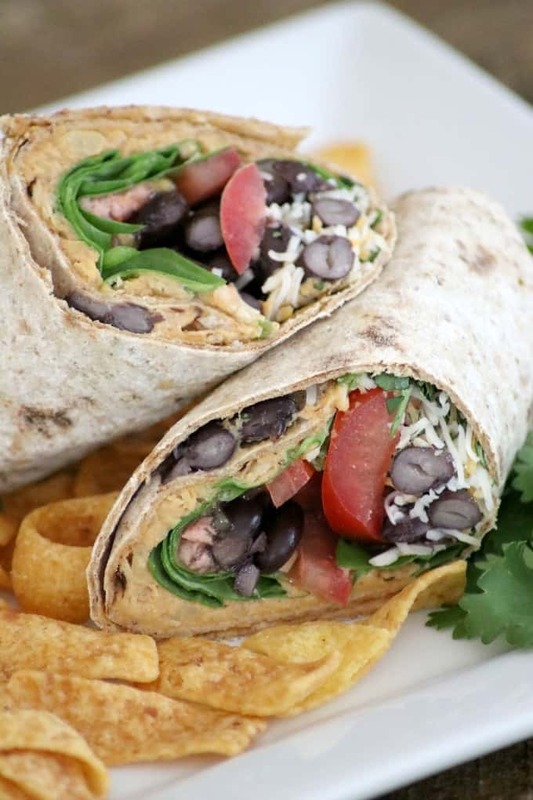 These Taco Hummus Wraps are a tasty way to change things up for Taco Tuesday and the homemade hummus is a great base for your favorite fixin's. Place all of the hummus ingredients with three tablespoons of the reserved chickpea water into a blender or food processor. Mix until completely smooth and well blended, adding the additional chickpea water if needed. It may be necessary to add just a little bit more of the chickpea water as well, but do so sparingly, until desired consistency is reached. Be sure that it is not runny. Spread two tablespoons of hummus out on one end of the tortilla or flatbread and spread an additional tablespoon on the opposite end. This will help to seal it and keep it from unrolling. Place a few spinach leaves on the hummus and add a few slices of tomato and some red onion slices. Cover with two tablespoons of the black beans. Sprinkle with one tablespoon of shredded cheese and some cilantro. 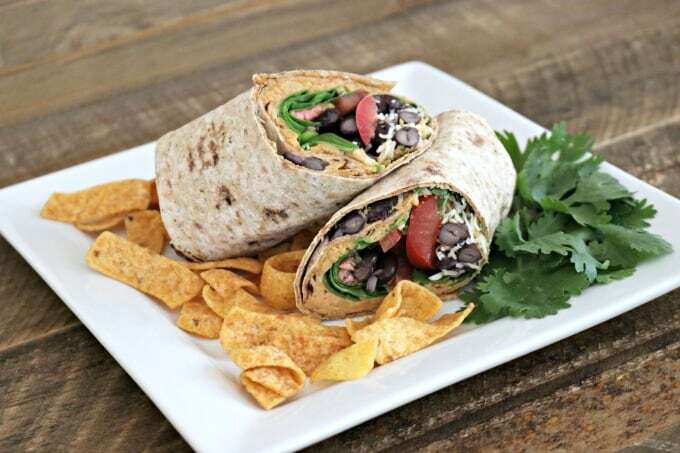 Fold in the sides of the tortilla slightly over the ingredients and roll up towards the opposite end to seal. Take a look at these videos for more great recipe ideas for your Bush’s Beans! I can’t wait to try this. I think my family will love it. Thanks so much, Leanne. I hope they do!